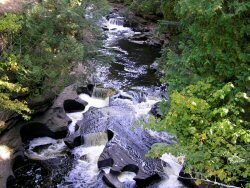 Portions of this river are considered by some as the most challenging whitewater in Michigan, if not in the Midwest. This river is listed as one of the ten North American rivers that "defines the outer edge of contemporary whitewater paddling." Designated Reach: March 3, 1992. The main stem from the confluence of the East and West Branches to Minnewawa Falls. The East Branch within the Ottawa National Forest. The South Branch within the Ottawa National Forest. The West Branch within the Ottawa National Forest. Classification/Mileage: Scenic -- 19.0 miles; Recreational -- 38.0 miles; Total -- 57.0 miles. Both the West and South branches offer relatively slow moving water. Put in off of Forest Road 8100 at the Teal canoe landing on the West Branch north of the Henry Lake campground, or on the South Branch south of Hawk Lake ½ mile west of M-64 at the Mallard canoe landing on Forest Road 8100. The branches join south of Marenisco. The trip from there has a long portage at Yondota Falls. Bring your rod for trout and northern pike. Canoeing north of M-28 is not recommended.